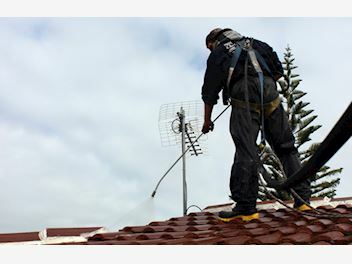 Solar Chem Roofing - Exterior Cleaning Services House Washing, Drives, Decks, Roofs, Eco-Friendly Biocide Solutions Enhance and protect your property and remove any dangerous and slippery areas. We recommend scheduled annual cleaning to prevent asset degradation and ensure safety on walking surfaces. Types •	Roofs •	House Washing •	Commercial Buildings •	Drives, Pathways •	Wooden Decks Services - Exterior Treatment - Exterior Cleaning (instant results), using one of Solar Chem’s low active eco-friendly biocide solutions for exterior building maintenance. - Scheduled Maintenance We use a low pressure, non-toxic solution to dissolve dirt and grime for an instant exterior clean of house and building exteriors. This removes unsightly grime to protect paint and enhance your property’s appearance and value. 5+ YEARS’ EXPERIENCE 10,000+ HAPPY CUSTOMERS Formed in 1976, Solar Chem Roofing established the roof resurfacing industry in New Zealand and are considered leaders in this industry. Understanding roof maintenance is our business. -Site SafeMember of Roofing Association NZ -Over 35 years in business and loving every minute -Member of the Roofing Association NZ -Member of Site Safe -Guarantees given on all services -Experienced, friendly staff Contact us today for a free quote! Visit http://solarchem.co.nz/ for more information.